KENTS HILL -- The Cony hockey team hadn't played in a week, and the rust showed a bit Monday afternoon against the Maranacook/Hall-Dale/Winthrop co-operative team. 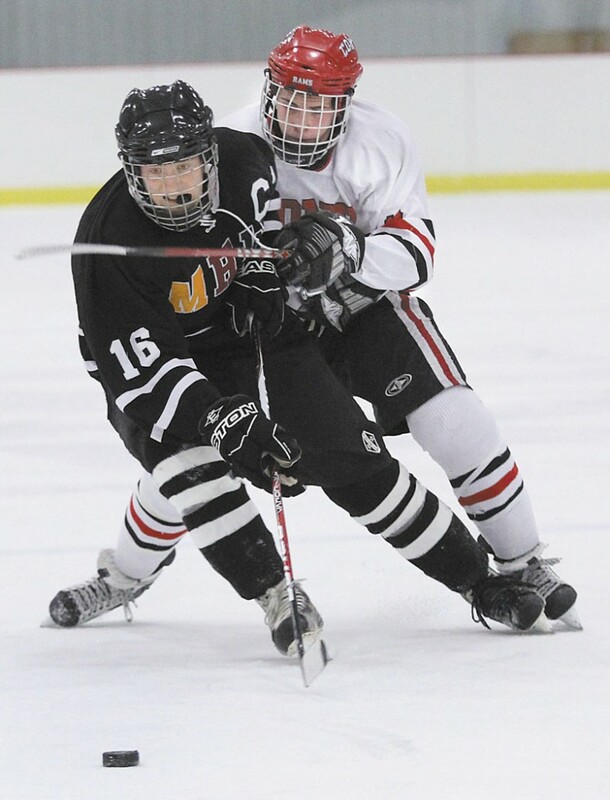 KENTS HILL — The Cony hockey team hadn’t played in a week, and the rust showed a bit Monday afternoon against the Maranacook/Hall-Dale/Winthrop co-operative team. MHW had momentum and some confidence after snapping a two-game losing slide, and that showed, too, Monday. Jared Hanson scored a pair of second-period goals and MHW hung on late to beat Cony 4-2 in an Eastern A game at Bonnefond Ice Arena. Matt Plourde and Chris Stanley also scored for the Hawks (2-2-0), who’ve won two straight after opening the season 0-2-0. Dan Condon had three assists and Tyler Plante earned the win with 20 saves. Dallas Clark and Dakota Bowie scored for the Rams (1-1-0), who struggled to get into any rhythm offensively. The teams were tied 1-1 after the first period before Hanson and the Hawks put the game away with a pair of goals about four minutes apart in the second. Hanson scored his first goal of the game just 3 minutes, 40 seconds into the second period on a nice pass from Condon. Condon carried the puck behind the Cony net and hit a wide-open Hanson in the slot. Hanson buried a breakaway chance about four minutes later after taking another nice pass from Condon in the neutral zone. The Rams didn’t go quietly, however. Dakota Bowie redirected a shot from Spencer Buck past Plante just a minute into the third to pull Cony within 3-2. Clark almost scored the equalizer a few minutes later, again on a tip, but the puck sailed just wide of the far post. Stanley capped the scoring with an insurance goal with 2:27 left in the third. Senior goalie Matt Swan had 29 saves and Buck had two assists for Cony.